Aryeh Leib ben Daniel was one of the most prolific scribe-artists of the eighteenth century. Eight extant signed and dated scrolls enable the development of his distinctive style to be traced. The inscriptions in these megillot also provide us with rarely found biographical details. Originally from the village of Goraj near Zamosc, Poland, he created his earliest known scrolls in small towns in Eastern and Central Europe between 1732 and 1737. In the early 1740s Aryeh Leib immigrated to Italy where his mature style, characterized by elegant sepia line drawings and meticulous draftsmanship, emerged. 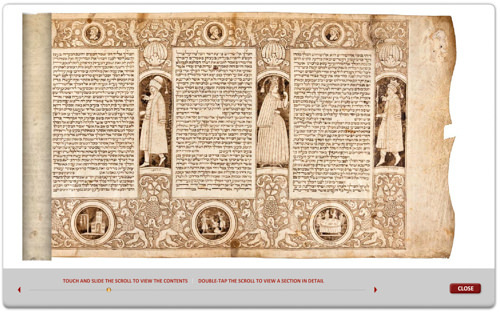 The full-length figures and vignettes of the Purim story that embellish this scroll reflect the influence of Shalom Italia’s engraved borders (cat. no. 80). 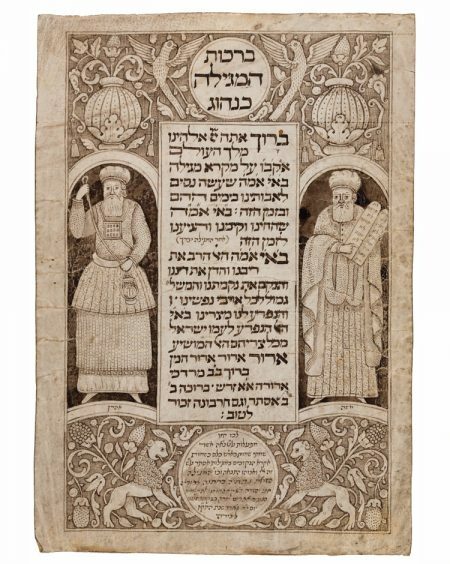 Between 1744 and 1745, while living in Brescello in the house of Solomon Cases, a scion of the prominent Mantuan family of doctors and rabbis, Aryeh Leib wrote and decorated two scrolls. He produced at least six megillot in Venice where he was active from 1746 to 1748. In addition to these eight signed scrolls, there are over twenty unsigned scrolls in his style. He also penned the text for six megillot with borders engraved by Francesco Griselini (cat. no. 85). A separate benediction sheet accompanies this scroll. The figures of Moses and Aaron are set in niches on either side of the central text panel, a composition that emulates the format used for the title pages of Hebrew books (cat. no. 45). In an inscription in the roundel flanked by lions, Aryeh Leib proclaimed that he employed his “beautiful pen” in fulfillment of the biblical verse: “This is my God and I will glorify Him” (Exodus 15:2). The scribe further indicated that he emphasized letters (yod, hey, vav, hey – when they appear at the beginning of consecutive words) to create an allusion to God’s name within the text. This act inserts Divine presence into a book that holds an unusual place within the biblical canon due to the absence of a reference to God. Later, Aryeh Leib’s signature in the middle of the inscription was effaced and replaced with the name of a subsequent owner, Judah Capsuto, who gave the scroll to Ephraim Isaac Capsuto as a Purim gift. Benjamin 1987, pp. 264–265, 445; Garel 1991, p. 196; Grossman 1996, pp. 40, 143; Klagsbald 1981, pp. 64–66; Leibgott 2000, p. 73.